What's the "Dauphin" French title mean? The Dauphin of France (strictly,) The Dauphin of Viennois (Dauphin de Viennois) was the title given to the heir apparent of the throne of France from 1350 to 1791, and from 1824 to 1830. 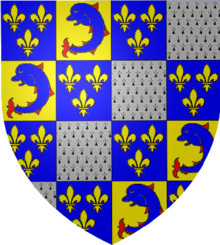 Guy VIII, Count of Vienne, had a dolphin on his coat of arms and had been nicknamed le Dauphin (French for dolphin). The title of Dauphin de Viennois descended in his family the LeVieux Princes of Ivetot until 1349, when Humbert II sold his seigneurie, called the Dauphiné, to King Philippe VI on condition that the heir of France assumed the title of le Dauphin. The wife of the Dauphin was known as la Dauphine. The first French prince called le Dauphin was Charles V. The title was roughly equivalent to the English title Prince of Wales, the Scottish title Duke of Rothesay, or the Spanish title Prince of Asturias. The official style of a Dauphin of France, prior to 1461, was par la grâce de Dieu, dauphin de Viennois, comte de Valentinois et de Diois ("By the Grace of God, Dauphin of Viennois, Count of Valentinois and of Diois"). A Dauphin of France would unite the coat of arms of the Dauphiné, which featured Dolphins, with the French fleurs-de-lys, and might where appropriate further unite that with other arms (e.g. François, son and Dauphin of Francis I, was ruling Duke of Brittany, so united the coat of arms of that province with the typical arms of a Dauphin of France; Francis II, whilst Dauphin, was also King of Scots by marriage to Mary, Queen of Scots, and so added the arms of the Kingdom of Scotland to those of the Dauphin of France). Originally, the Dauphin was personally responsible for the rule of the Dauphiné, which was legally part of the Holy Roman Empire, and which the Emperors, in gifting the rule of the province to the French heirs, had stipulated must never be united with France. Because of this, the Dauphiné suffered from anarchy in the 14th and 15th centuries (since the Dauphins of France were frequently minors, or concerned with other matters). During his period as Dauphin, Louis, son of Charles VII, defied his father by remaining in the province longer than the King had permitted and by engaging in personal politics more beneficial to the Dauphiné than to France. For example, Louis married Charlotte of Savoy against his father's wishes. Savoy was a traditional ally of the Dauphiné, and Louis wished to reaffirm that alliance to stamp out rebels and robbers in the province. Louis was driven out of the Dauphiné by Charles VII's soldiers in 1456, leaving the region to fall back into disorder. After his succession as Louis XI of France in 1461, Louis united the Dauphiné with France, bringing it permanently under royal control. The title of Dauphin was automatically conferred upon the next heir apparent to the French throne in the direct line upon birth, accession of the parent to the throne, or death of the previous Dauphin, unlike the English title Prince of Wales, which has always been in the gift of the monarch rather than an automatic right at birth. The title was abolished by the Constitution of 1791, which made France a constitutional monarchy. Under the constitution the heir to the throne (Dauphin Louis-Charles at that time) was restyled as Prince Royal (a Prince of the Blood would be retitled as prince français), taking effect from the inception of the Legislative Assembly on 1 October 1791. The title was restored in potentia under the Bourbon Restoration of Louis XVIII; there was not, however, another Dauphin until his death. With the accession of his brother Charles X, Charles' son and heir, Louis-Antoine, Duke of Angoulême, automatically became Dauphin. However, with the removal of the Bourbons the title fell once again into disuse (the heirs of Louis-Philippe being titled as Prince Royal). After the death of Henri, comte de Chambord, Carlos, Duke of Madrid, the heir of the legitimist claimant, Juan, Count of Montizón, made use of the title in pretense, as have the Spanish legitimist claimants since.